The Syro-Malabar Church is headed by the Metropolitan and Gate of all India Mar Cardinal George Alencherry of the Archeparchy of Ernakulam-Angamaly in Kerala. The Church uses the Divine Liturgy of Saints Mar Addai and Mar Mari belonging to the East Syriac Rite, which dates back to 3rd century Edessa, as such it is a part of Syriac Christianity by liturgy and heritage. The name Syro-Malabar is coined from the words Syriac (referring to the East Syriac liturgy) and Malabar (the historical name for Kerala). The name has been in usage in official Vatican documents since the nineteenth century. As per Mar Paremmakkal Thoma Kathanar's travelogue Varthamanappusthakam (dated to 1790), the Church was known then as the Malankare Kaldaya Suriyani Sabha (Malankara Chaldean Syriac Church). The Church shares the same liturgy with the Chaldean Catholic Church based in Iraq and the Nestorian Chaldean Syrian Church based in Thrissur, Kerala, which is an archbishopric of the Assyrian Church of the East based in Iraq. The Syro-Malabar Church is the third-largest particular church (sui juris) in the Catholic Church (after the Latin or Roman Church and the Ukrainian Greek Catholic Church). The Syro-Malabar Church is the largest of the "Nasrani" (St. Thomas Christians) denominations with over 4 million believers and traces its origins to the evangelistic activity of Thomas the Apostle in the 1st century. Syro-Malabar scholar and theologian Mar Placid Podipara describes the Church as "Catholic by faith, Indian by culture, and East Syriac/Oriental in liturgy." The Syro-Malabar Church members are predominantly of the Malayali ethnic group and speak Malayalam. Following emigration of its members, eparchies have opened up in other parts of India and other countries due to facilitating the Malayali diaspora living in North America, Australia and the United Kingdom. Saint Alphonsa is the Church's first canonized saint, followed by Saint Kuriakose Chavara and Saint Euphrasia. It is one of the two Eastern Catholic churches in India, the other one being the Syro-Malankara Catholic Church which uses the West Syriac Rite. Rome sent Carmelites in two groups from the Propagation of the Faith to Malabar headed by Fr. Sebastiani and Fr. Hyacinth. Fr. Sebastiani arrived first in 1655. He began to directly with the Archdeacon, Mar Thoma I. Fr. Sebastiani, with the help of Portuguese, gained the support of many, especially with the support of Palliveettil Mar Chandy, Kadavil Chandy Kathanar and Vengoor Geevarghese Kathanar . These were the three of the four counselors of Mar Thoma I, who had been defected with Francisco Garcia Mendes, SJ, Archbishop of Cranganore, before the arrival of Sebastaini, according to Jesuit reports. Between 1661 and 1662, out of the 116 churches, the Carmelites claimed eighty-four churches, leaving the native metropolitan Mar Thoma I with thirty-two churches. The eighty-four churches and their congregations were the body from which the Syro Malabar Catholic Church has descended. The other thirty-two churches and their congregations represented the nucleus from which the Malankara Orthodox Syrian Church, the Thozhiyur Church, Mar Thoma Syrian (Reformed Syrians), Syro-Malankara Catholic Church have originated. In 1665 Mar Gregorios, a Bishop sent by the Syriac Orthodox Patriarch of Antioch, arrived in India. The independent group under the leadership of the Archdeacon welcomed him. Though most of the St. Thomas Christians gradually relented in their strong opposition to the Western control, the arrival of the Bishop Mar Gregorios of the Syriac Orthodox Church in 1665 marked the beginning of a formal schism among the St. Thomas Christians. Those who accepted the West Syriac liturgical tradition of the Syriac Orthodox Church of Antioch of Mar Gregorios became known as the Puthenkoor; they also continued to use the name "Malankara," the real name of the St. Thomas Christian community for the church. 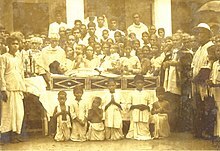 Those who joined the communion of Rome after the Synod of Daimper and remained in the communion even after the oath of bent cross, and those who joined the catholic communion from the Puhenkoor Malankara church during the Carmelite period, came to be known as the Syro Malabar Church from the last decade of the Nineteenth century onwards. Some of the churches not joined in the Angamaly Padiyola (1787) later became Latin churches, e.g. Mathilakom (Pappinivattom), Maliankara, Thuruthipuram etc. One branch of the Syro Malabar Catholic church later left to form the Assyrian Church of the East aligned Chaldean Syrian Church when an Eastern Syriac rite bishop, Mar Gabriel, came to evangelize them in 1701. Kottayam cheriapalli was the headquarters of Mar Gabriel. After the split in the church community, the Catholics of the Malabar coast faced an identity crisis and thus some priests and laymen attempted to persuade the hierarchy to improve the identity of the local church and for the appointment of bishops from local priests. To represent their position, Kerala's Syrian Catholics Joseph Kariattil and Paremmakkal Thomma Kathanar went to Rome in 1778. While they were in Europe, Kariatty Joseph Kathanar was installed in Portugal as the Archbishop of Kodungalloor Archdiocese. While journeying home, they stayed in Goa where Kariattil died before he could formally take charge. Before he died, Kariattil appointed Kathanar as the Administrator of Kodungalloor Archdiocese after him. The new administrator ran the affairs of the church establishing his headquarters at Angamaly. In 1790, the headquarters of the Archdiocese was shifted to Vadayar dodging the invasion of Tippu Sultan. In the last four years of his life, Thomma Kathanar managed church administration from his own parish, Ramapuram. After being under Babylonian Assyrian Church of the East (Catholic faction of this church is known as Chaldean Catholic Church from 1681) bishops earlier and under Latin Church Roman Catholic bishops from 1599, Catholics of St. Thomas Christians obtained their own bishops from 1896. They were known as Catholic Chaldean Syrians during the period from around 1787(Angamaly Padiyola) to around 1911. They were known as the Catholic Syrians or Romo-Syrians to differentiate them from the Orthodox Syrians and Latin Church Catholics in Kerala. They came to be known as the Syro Malabar Catholics from 1932 onwards to differentiate them from the Syro-Malankara Catholics in Kerala. The Indian East Syriac Catholic Hierarchy was restored on 21 December 1923 with Mar Augustine Kandathil as the first Metropolitan and Head of the Church with the name Syro-Malabar. 6 A Sui iuris Church. Syro-Malabar Historian and theologian Fr. Placid Podipara describes it as "Catholic by faith, Indian by culture & East Syrian/Syriac/Oriental in liturgy." Today, the Syro-Malabar Church finds herself as the second-largest Eastern Catholic Church in the world with over 5.1 million members worldwide. The St. Thomas Christians got their bishops from the Assyrian Church of the East/Chaldean Church from ca. 300 AD till the end of the sixteenth century, until it was stopped by the Portuguese Roman Catholics (Catholics) in 1597, after the death of Mar Abraham. "Syro-Malabar rite" redirects here. For other liturgical customs or practices from South India, see Malabar rites. As per the East Syriac tradition, liturgical day of the Syro-Malabar Church starts at sunset (6 p. m.). Also the worshiper has to face the east while worshiping. This is not followed after Latinization. The Holy Mass, which is called Holy Qurbana in East Syriac Aramaic and means 'Eucharist', is celebrated in its solemn form on Sundays and special occasions. During the celebration of the Qurbana, priests and deacons put on elaborate vestments which are unique to the Syro-Malabar Catholic Church. Metropolitan and Gate of all India Mar Geevarghese metropolitan, Successor of Marthoma Sleeha (St. Thomas Apostle). East Syriac liturgy has three anaphorae: those of the Holy Apostles (Saints Addai and Mari), Mar Nestorius, and Mar Theodore the Interpreter. The first is the most popularly and extensively used. The second was traditionally used on the Epiphany and the feasts of St. John the Baptist and of the Greek Doctors, both of which occur in Epiphany-tide on the Wednesday of the Rogation of the Ninevites, and on Maundy Thursday. The third is used (except when the second is ordered) from Advent to Palm Sunday. The same pro-anaphoral part serves for all three. In the second half of 20th century, there was a movement for better understanding of the liturgical rites. A restored Eucharistic liturgy, drawing on the original East Syriac sources, was approved by Pope Pius XII in 1957 and for the first time on the feast of St. Thomas on July 3, 1962, the vernacular, Malayalam, was introduced for the celebration of the Syro-Malabar Qurbana. Currently they celebrate the Divine Liturgy of Addai and Mari and the Anaphora of Mar Theodre in mostly Malayalam, with Syriac and English influences. Besides the Anaphora of Mar Addai and Mari being used currently in Syro-Malabar liturgy, there are two more anaphorae known as Anaphora of Mar Theodore and Anaphora of Mar Nestorius. That the Anaphora of Mar Theodore which was withdrawn from use after the Synod of Diamper(a large number of churches used it up to 1896) is being used again in Syro-Malabar Church after 415 years is indeed an important historical reality.In a way SyroMalabar church rejected Synod of Diamper Pope Pius XII during the process of restoration of the Syro-Malabar Qurbana in 1957 had requested the restoration of the Anaphorae of Mar Theodore and Mar Nestorius. The draft of the Anaphora of Mar Theodore was restored after meticulous study by the Central Liturgical Committee, Liturgical Research Centre, various sub-committees and the eparchial liturgical commissions. Many changes befitting to the times have been made in the prayers maintaining maximum fidelity to the original text of the Second Anaphora. It was this text so prepared that was sent to Rome for the recognition of the Apostolic See in accordance with the decision of the Syro-Malabar Synod. The Congregation for the Eastern Churches gave its approval for using this anaphora on an experimental basis for three years on 15 December 2012. After almost 420 years, the Anaphora of Mar Nestorius is restored in SyroMalabar church "http://www.syromalabarchurch.in/news_details.php?news=9670".Aftermath the so-called Synod of Diamper, any text related to Mar Nestorius were systematically burnt by the Jesuits, who represented and ruled Latin Church of India in 1599.In a way SyroMalabar church rejected Synod of Diamber (Udayamperoor) by restoring the Anaphora of Mar Theodore and Anaphora of Mar Nestorius. The Latinization of the Syro-Malabar rite churches was brought to a head when in 1896 Ladislaus Zaleski, the Apostolic Delegate to India, requested permission to translate the Roman Pontifical into Syriac. This was the choice of some Malabar prelates, who chose it over the East Syriac Rite and West Syriac Rite pontificals. A large number of Syro-Malabarians were Assyrian schismatics at that time and various problems and concerns delayed the approval of this translation, until in 1934 Pope Pius XI stated that Latinization was no longer to be encouraged among Eastern Rite Catholics. He initiated a process of liturgical reform that sought to restore the oriental nature of the Latinized Syro-Malabar rite. A restored Eucharistic liturgy, drawing on the original East Syriac sources, was approved by Pius XII in 1957 and introduced in 1962. The church uses one of several Bible translations into Malayalam. Syriac inscription at Syro-Malabar Catholic Major Archbishop's House, Ernakulam. The curia of the Syro-Malabar Church began to function in March 1993 at the archbishop’s house of Ernakulam-Angamaly. Later, on 27 May 1995, it was shifted to new premises at Mount St. Thomas near Kakkanad, Kochi. The newly constructed curial building was opened on 3 July 1998. The administration of the Syro-Malabar Church has executive and judicial roles. The major archbishop, officials, various commissions, committees, and the permanent synod form the executive part. The permanent synod and other offices are formed in accordance with the CCEO. The officials include the chancellor, vice-chancellor, and other officers. Various commissions are appointed by the major archbishop: Liturgy, Pastoral care of the migrant and Evangelisation, Particular Law, Catechism, Ecumenism, Catholic Doctrine, Clergy and Institutes of Consecrated Life and Societies of Apostolic Life. The members of the commissions are ordinarily bishops. But there are also priests in different commissions. For judicial activities there is the major archiepiscopal ordinary tribunal formed in accordance with CCEO and it has a statutes and sufficient personnel with a president, as its head. At present, Rev. Dr. Jose Chiramel is the president. The Major archiepiscopal curia functions in the curial building in Kerala, India. They have prepared the particular law for their Church and promulgated part by part in Synodal News, the official Bulletin of this Church. There are statutes for the permanent synod, for the superior and ordinary tribunals. Regarding economo, CCEO c. 122 § 2 is specific in the particular law, that the term of the office shall be five years and the same person shall not be appointed for more than two terms consecutively. Syro-Malabar bishops at the Generalate of S. D.
There are 35 eparchies (dioceses). Five of them are Archeparchies at present, all in southern India: The major Archbishop's see Ernakulam-Angamaly, Changanacherry, Trichur, Tellicherry and Kottayam. Those have another 13 suffragan eparchies : Bhadravathi, Belthangady, Irinjalakuda, Kanjirapally, Kothamangalam, Idukki, Mananthavady, Mandya, Palai, Palghat, Ramanathapuram, Thamarassery and Thuckalay within the canonical territory of the Major Archiepiscopal Church. There are 13 further eparchies outside the canonical territory of which Adilabad, Bijnor, Chanda, Gorakhpur, Jagdalpur, Kalyan, Rajkot,Sagar,Satna,Faridabad,Hosur,Shamsabad and Ujjain in India are with exclusive jurisdiction and the St. Thomas Eparchy of Chicago in the United States of America and St. Thomas the Apostle Eparchy of Melbourne in Australia,Eparchy of Great Britain,Eparchy of Mississauga, Canada enjoy personal jurisdiction. Most believers of this church are organized under 5 Metropolitan Archeparchies (archdioceses), all in Kerala, and their suffragan eparchies. Late Mar Varkey Vithayathil former Major Archbishop. The Religious Congregations are divided in the Eastern Catholic Church Law (Code of Canons of the Oriental Churches – CCEO) as Monasteries, Hermitages, Orders, Congregations, Societies of Common Life in the Manner of Religious, Secular Institutes and Societies of Apostolic Life. According to the Annuario Pontificio (the pontifical yearbook) for 2016 there were about 4,189,349 members in the Syro-Malabar Church. There are sixteen eparchies in the proper territory of the Syro Malabar Church. Archeparchy of Ernakulam-Angamaly has 510,000 members with 347 parishes, 731 religious/secular priests, 632 male religious and 4935 female religious. Archeparchy of Trichur has 471,328 members with 195 parishes, 418 religious/secular priests, 358 male religious and 3315 female religious. Eparchy of Idukki has 270,000 members with 129 parishes, 119 religious/secular priests, 109 male religious and 1320 female religious. Archeparchy of Changanacherry has 390,000 members with 266 parishes, 615 religious/secular priests, 534 male religious and 2705 female religious. Eparchy of Palai has 348,128 members with 169 parishes, 502 religious/secular priests, 127 male religious and 3312 female religious. Archeparchy of Tellicherry has 317,782 members with 222 parishes, 293 religious/secular priests, 263 male religious and 1664 female religious. Eparchy of Irinjalakuda has 258,200 members with 128 parishes, 233 religious/secular priests, 132 male religious and 2350 female religious. Eparchy of Kothamangalam has 217,420 members with 115 parishes, 242 religious/secular priests, 163 male religious and 2210 female religious. Eparchy of Kanjirapally has 192,000 members with 136 parishes, 314 religious/secular priests, 210 male religious and 1840 female religious. Archeparchy of Kottayam has 175,300 members with 149 parishes, 161 religious/secular priests, 107 male religious and 1233 female religious. Eparchy of Mananthavady has 170,100 members with 140 parishes, 413 religious/secular priests, 358 male religious and 1546 female religious. Eparchy of Thamarasserry has 129,600 members with 128 parishes, 247 religious/secular priests, 257 male religious and 1321 female religious. Eparchy of Palghat has 68,004 members with 106 parishes, 167 religious/secular priests, 82 male religious and 1360 female religious. According to a study conducted, in Kerala about 30 percent of the Syro Malabar Church members lived in the erstwhile Cochin State. The remaining 70 percent lived in Travancore state. In the Travancore state, Meenachil Taluk had the largest proportion, followed by Changanaserry Taluk. Erstwhile Cochin State, Meenachil (Palai) and Changanaserry together had 56 percent of the total Syro Malabar population. Kottayam, Pala, Muvattupuzha, Kanjirappally, Thodupuzha, Kothamangalam, Cherthala, Mukundapuram (irinjalakkuda-chalakkudy), Wadakkancherry, Thrissur, North Parur, Alwaye, Kunnathunadu, Ambalapuzha, Kuttanad, Peerumedu, Nedumkandam and Devikulam etc. are the prominent taluks. There are eleven eparchies outside the proper territory of the Syro Malabar Church. The Eparchy of Kalyan has 100,000 members with 106 parishes, 146 religious/secular priests, 105 male religious and 270 female religious. St. Thomas Syro-Malabar Catholic Diocese of Chicago, USA has 85,000 members with 11 parishes, 45 religious/secular priests, 13 male religious and 16 female religious. The Eparchy of Canada has 14,079 members with 5 parishes, 51 religious/secular priests, 182 male religious and 352 female religious. The Eparchy of Adilabad, has 13,273 members with 25 parishes, 50 religious/secular priests, 41 male religious and 143 female religious. The Eparchy of Rajkot has 12,850 members with 12 parishes, 140 religious/secular priests, 142 male religious and 421 female religious. There is a significant diaspora of Syro-Malabar Catholics in countries not under the jurisdiction of any of the existing eparchies. Funeral of Venerable Mar Varghese Payyappilly Palakkappilly on 6 October 1929. St. Joseph's Syro-Malabar Monastery Church, Mannanam where the mortal remains of Mar Kuriakose Elias Chavara are kept. The Varthamanappusthakam is the first travelogue written in the Malayalam language. It is written by Paremmakkal Thoma Kathanar. It describes the history of the Nasrani Church between the years 1773 and 1786 with emphasis on the journey of its author and Malpan Mar Ousep (Joseph) Kariattil from Malabar to Rome via Lisbon and back. Despite attempts by European ecclesiastical authorities to destroy it the major part of this book survived. Abraham of Angamaly (Syriac: ܐܒܪܗܡ ܡܛܪܢ, Mar Abraham died c. 1597) was the last in the long line of Mesopotamin Bishops who governed the Church of Saint Thomas Christians. In spite of the express approbation of the Pope, he was not welcomed by the Portuguese ecclesiastical authorities. Mar Abrham died in January 1597 at Angamaly and his body was buried in Mar Hormiz Syro-Malabar Catholic Church, Angamaly (old Cathedral church). ^ Fr. George Thalian: "'The Great Archbishop Mar Augustine Kandathil, D. D.: the Outline of a Vocation'". Archived from the original on 1 March 2012. Retrieved 27 April 2011. CS1 maint: Unfit url (link), Mar Louis Memorial Press, 1961. (Postscript) (PDF). ^ The Synod of Diamper and the Liturgy Jacob Vellian The Synod of Diamper Revisited, George Nedugatt, ed. ^ a b c d , Syro Malabar Church: An Overview. ^ a b "Provisions for the Syro-Malabar Church, 10.10.2017" (Press release). Holy See Press Office. Retrieved 24 May 2018. ^ At a Glance, Syro Malabar Church Website. ^ "Syro-Malabar Church Dublin Ireland". Retrieved 27 August 2016. ASSEMANI, Bibliotheca Orientalis (Rome, 1719–28); DE SOUZA. Orientale Conquistado (2 vols., Indian reprint, Examiner Press, Bombay). Gouvea, Jornada do Arcebispo Aleixo de Menezes quando foy as Serra do Malaubar (Coimbra, 1606). Fr. tr. De Glen, Histoire Orientale etc. (Brussels, 1609); DU JARRIC. Thesaurus rerum mirabilium in India Orient (3 vols., Cologne, 1615). India Orientalis Christiana (Rome, 1794). Mackenzie, Christianity in Tranvancore, with Census Report of 1901 (Trivandrum). Ed.& Reprinted, Prof. George Menachery in the Nazranies i.e. The Indian Church History Classics I, 1998. Medlycott, India and the Apostle St. Thomas (London, 1905). Ed. & Reprinted, Prof. George Menachery in the Nazranies i.e. The Indian Church History Classics I, 1998. Thalian, Fr. George: "`The Great Archbishop Mar Augustine Kandathil, D. D.: the Outline of a Vocation'". , Mar Louis Memorial Press, 1961. (Postscript) (PDF). Menachery G (1973) The St. Thomas Christian Encyclopedia of India, Ed. George Menachery, B.N.K. Press, vol. 2, ISBN 81-87132-06-X, Lib. Cong. Cat. Card. No. 73-905568; B.N.K. Press – (has some 70 lengthy articles by different experts on the origins, development, history, culture ... of these Christians, with some 300 odd photographs). Vol. 1, 1982. Vol. 3, 2010. Mundadan, A. Mathias. (1984) History of Christianity in India, vol. 1, Bangalore, India: Church History Association of India. Philip, E. M. (1908) The Indian Christians of St. Thomas (1908; Changanassery: Mor Adai Study Center, 2002). Menachery, Professor George & Snaitang, Dr. Oberland (2012)"India's Christian Heritage". The Church History Association of India, Dharmaram College, Bangalore. Michael Geddes, (1694) A Short History of the Church of Malabar together with the Synod of Diamper, London. Ed. Prof. George Menachery in the Nazranies i.e. The Indian Church History Classics I, 1998. Menachery G (ed); (1998) "The Indian Church History Classics", Vol. I, The Nazranies, Ollur, 1998. ISBN 81-87133-05-8. Menachery, George. Glimpses of Nazraney Heritage.SARAS 2005 Ollur. Palackal, Joseph J. Syriac Chant Traditions in South India. Ph.d, Ethnomusicology, City University of New York, 2005. Joseph, T. K. The Malabar Christians and Their Ancient Documents. Trivandrum, India, 1929. Thomas P. J; (1932) "Roman Trade Centres in Malabar", Kerala Society Papers, II. Bjorn Landstrom (1964) "The Quest for India", Double day English Edition, Stockholm. Francis Eluvathingal (ed), Syro-Malabar Church Since the Eastern Code, Mary Matha Publications, Trichur, 2003. Francis Eluvathingal, "Patriarchal and Major Archiepiscopal Curia in the Eastern Catholic Legilations based on CCEO Canons 114–125" ORISI, Kottayam, 2009. Wikimedia Commons has media related to Syro-Malabar Catholic Church. Indian Christianity : Books by Geddes, Mackenzie, Medlycott, &c.